Food allergies are a type of immune system disorder. The healthy human immune system fights off viruses, bacteria, and parasites. In a person with a food allergy, the immune system mistakenly tries to fight certain foods, too, often with disastrous consequences. Why some people’s bodies mistake friendly foods for potentially deadly foes is still a scientific mystery. But how a food allergy, once triggered, can cause the body harm is fairly well understood. When dangerous disease-causing pathogens invade the body, the immune system responds to the threat in part by creating protein structures called antibodies that are custom shaped to stick to proteins on the surface of a certain type of virus, bacteria or parasite. Antibodies can help slow an invader down by covering it in sticky protein. They also mark the pathogen as foreign to help disease-fighting immune cells target it and destroy it. After a new type of pathogen has been defeated, some of the cells that create the specialty antibodies made to fit that particular invader stick around in the body– sometimes for years, sometimes for a lifetime– giving the immune system a “memory” of enemies it has defeated in the past so it can conquer them more quickly in the future. Immunological memory is what makes vaccines work. It’s what makes most people not catch chicken pox again after they’ve already had it. It’s what makes you better at fighting a new flu strain if you’ve already had a similar strain before. Immunological memory is mostly a very good thing. But in people with food allergies, the immune system’s long memory poses a problem. Because after the immune system mistakenly identifies a food as an invader once, it memorizes the shape of an ordinary food protein and keeps producing antibodies that misidentify that once-perfectly-safe food as an imminent danger. Thereafter, any time a person with a food allergy eats the food he or she is allergic to, the immune system responds as if it were being invaded. If enough allergenic food protein enters the body, it can trigger a severe, potentially life-threatening allergic reaction called anaphylaxis. 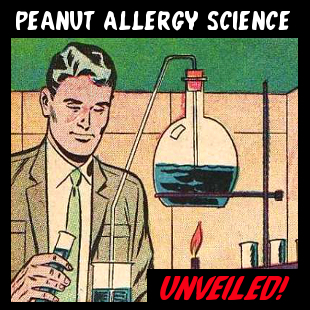 MORE PEANUT ALLERGY SCIENCE COMING SOON!